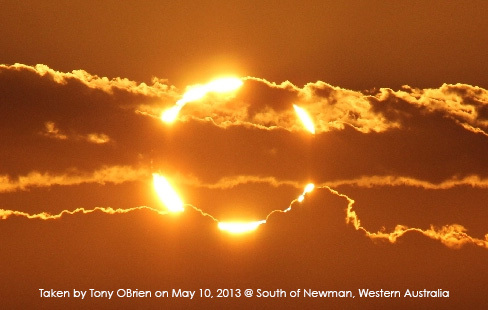 May 21, 2013 May 21, 2013 jodyharmonLeave a Comment on May 24, 2013: Eclipses and Solar Flares : DO YOU FEEL IT? May 24, 2013: Eclipses and Solar Flares : DO YOU FEEL IT? Here we are in the 5th Month of 2013. We are in Eclipse season. Two Lunar and one Solar, with the Second Lunar occurring this Friday, May 24. What has May brought to you so far? On May 9th, the day of the Solar eclipse the energy was so strong, it was almost like being under the influence, and yes we are under the influence of something. Most certainly. But what? During this Solar Eclipse our beautiful Sun filtered the Rays of Taurus-stubborn, earthy, sensual. A builder for sure, the shadow of all that is Scorpio the destroyer. During a Solar Eclipse the energy field intensifies and we feel it much more strongly. Our nervous systems are affected, we are after all electrical beings. The energy of Taurus is Fixed Earth, it is good for building, planting, creating or acquiring tangible structures in our lives. The energy of Scorpio is Fixed Water, it helps us release what is no longer needed for our soul’s evolution, for here we must go deep and let go of what we fear most. On May 24 during the second Lunar Eclipse, our lovely Moon filters the Rays of Sagittarius, the seeker of knowledge ruled by Jupiter, who is currently transiting its opposite sign, Gemini. The Sun and Jupiter, along with a small cluster of planets in Gemini filters the energy of the Twins, Mutable Air, they are forever immersed in duality. The energy of this Lunar Eclipse lends itself to thoughts, communication, ideas flashing across the ether. Although this eclipse is about creative ideas (Sagittarius-Mutable Fire), and communication (Gemini-Mutable Air), lunar eclipses tend to bring physical changes in our lives. What is changing in your life, and more importantly how are you meeting this change? The unconscious is rarely clear. However, that is our task in this life, to learn to see what lies beneath or outside our narrow realm of perception and begin to understand what connects us and drives us to do what we do, and what we are meant to do in this time and place. In some cultures Owl is considered a messenger, a being who sees in the darkness; be still for a moment on the day of this eclipse and listen to what messages your unconscious may have for you. The influx of the Light is strong these days, we only have to look at the darkness which has bubbled up in so many places and ripped open the very fabric of our reality and changed it forever. And finally, a few days ago, on May 13, something happened that caused our scientific brethren glee. The Sun was in X-Flare mode, (as in X-class, not M, C, B or A) for the first time in 2013. And if you think the Sun’s rays (which produce positive ions) and Moon’s rays, do not effect our behavior just take a quick peek here, even the cops get it, and provide us with some great information about how certain Winds affect us as well. The Sun has been and still is waking up and is waking US, ALL OF US, for better or for worse. We are here and in this for the long haul. So, stay centered, be calm, have compassion, pay attention, and most important stay in your Heart. My question to you this month is: Do you feel it? Previous May 20 2013 Uranus Square Pluto Exact: YOU WILL FEEL IT! Next May 31, 2013: Last Quarter Square Moon: WALK ON.